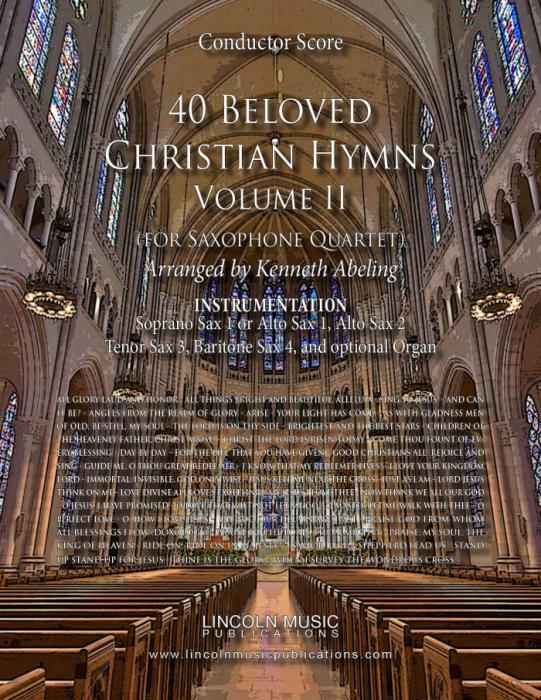 40 Beloved Christian Hymns Volume II for Saxophone Quartet is the second collection of traditionally scored, and frequently used hymns in many Christian worship services. This collection also includes an optional Organ part. The Titles Include: All Glory Laud And Honor - All Things Bright And Beautiful, Alleluia - Sing To Jesus! - And Can It Be? - Angels From The Realm Of Glory - Arise - Your Light Has Come! - As With Gladness Men Of Old, Be Still, My Soul - The Lord Is On Thy Side - Brightest And The Best Stars - Children Of The Heavenly Father, Christ Arose! - Christ The Lord Is Risen Today - Come Thou Fount Of Every Blessing - Day By Day - For The Life That You Have Given - Good Christians All, Rejoice And Sing - Guide Me, O Thou Great Redeemer - I Know That My Redeemer Lives! - I Love Your Kingdom Lord - Immortal, Invisible, God Only Wise - Jesus Keep Me Near The Cross - Just As I Am - Lord Jesus Think On Me - Love Divine All Love’s Excelling, -My Jesus I Love Thee - Now Thank We All Our God - O Jesus, I Have Promised - O Love That Wilt Not Let Me Go - O Master Let Me Walk With Thee - O Perfect Love - O, How I Love Jesus - Oh God, Our Help In Ages Past - Praise God From Whom All Blessings Flow (Doxology) - Praise To The Lord, The Almighty - Praise, My Soul, The King Of Heaven - Ride On, Ride On In Majesty! - Savior, Like A Shepherd Lead Us - Stand Up Stand Up For Jesus - Thine Is The Glory - When I Survey The Wondrous Cross.